A “bierkeller” is a traditional German bar that serves a wide range of German beers and food, in a social atmosphere and there is no better place than a bierkeller to practise your German! If you are taking a German evening language course with Cactus in Manchester why not discover more about German gastronomy and culture by visiting one of these bierkellers – just a few minutes walk from our Manchester school. 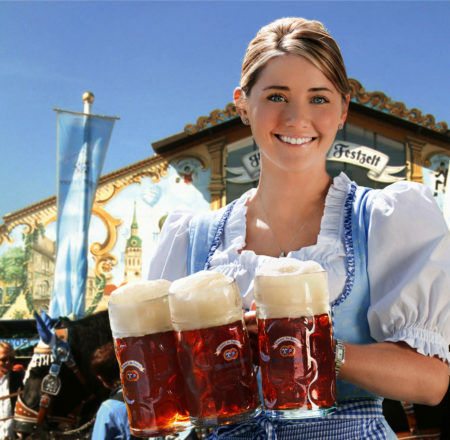 The Bierkeller is a distinctive Bavarian bar right in central Manchester and just a 10 minute walk from where our German evening courses take place. The friendly staff, dressed in classic Bavarian clothes, and live entertainment from German Oompah bands during the weekends, make of The Bierkeller a perfect venue to enjoy the best craft beers from Germany. Its signature kaserkraner sausage and bratwust with German mustard or a Black Forest gateau is a delightful final touch for an authentic German evening. Schloss is the German term for a palace or manor and Alberta��s Schloss houses a bakery, bier palace, wunderbar and live performances that bring the German and Czech culture to Manchester with a unique and lively atmosphere. Selected as the best pub in Greater Manchester in 2017 by Pub & Bar Magazine, Alberta��s bier palace offers top German and Czech beers, Alpine cocktails, homemade schnapps and ciders. Pretzels, doughnuts and cinnamon knots are freshly made in the Schlossa��s bakery every day. Its homemade artisan sausages, chicken schnitzel and apple strudel are another great reason to check out this Bavarian palace, just 10 minutes away from our school. If you are looking for a rare German beer at a different kind of British pub, Sandbar is a popular venue with a busy cultural programme. Known for its great selection of German and European beers Sandbar serves everything from Municha��s Hacker-Pschorr to Czech’s lemony pilsners with Sazz hops. Choose one of its outstanding beers alongside one of its famous stonebaked pizzas such as Tirolese, Inferno or any of its veggie and vegan options. To find out information on any of our German courses Manchester, or just general advice on German language learning, or how to start your language learning journey, please call us on 01273 830 960 or email us. Our multilingual team will be happy to answer any questions you may have.